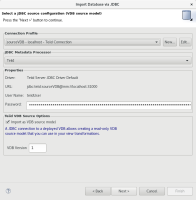 I imported model from JBDC importer (from Oracle DB). In the "select database objects" page I choose "Only selected schema" radio button (screenshot1) and then I continued. 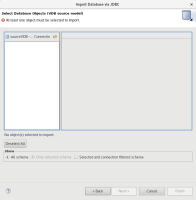 When I started import wizard again and I wanted import model from VDB data source (screenshot2) but in the "select database objects" page were selected two radio buttons (screenshot3) and didn't show any objects. 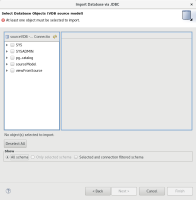 I think that the designer remembers my last choice but when I import data from VDB data source, this option is disabled. 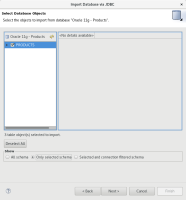 Import wizard shows me database objects after I click on the "All schema" (screenshot4). This is confusing because it had already selected this radio button.